After months of attending events, throwing out pitches, and courting potential champions, you’ve finally found an investor interested in helping you to elevate your start-up or growing business to the next level. Your satisfied with the amount of money that they are offering, but what do they want in return? As an attorney, I always tell my clients to understand the contract before you sign your company’s name to it. At the very least, you should personally read through the contract to acquire a general understanding of the terms and conditions; more advisable, hire an attorney to review the contract, have him/her make notes, and later meet with your attorney to have him/her explain the advantages and pitfalls of the proposed agreement. One of the major items you should review with your attorney is what the investor is looking to obtain in exchange for their investment in to your company. In one sense, this is an easy question to answer: they want more money than what they put in! However, you should be aware of how much money they are looking to acquire from your company, when they would expect it to come due, and most importantly, what vehicle they will be utilizing to acquire their return on investment from your company. In the most simplistic terms, this is a standard loan agreement. The investor is agreeing to loan you a specific amount of money at a fixed interest rate which you must pay back at a future time. Failure to make timely payments can (and likely will) result in a default of the loan and will require the entire amount lent to come due. Depending on whether the note was secured with company assets (or sometimes even personal assets), the investor may be able to foreclose on the secured assets in order to satisfy the debt owed. From an investor standpoint, this is a much safer route of investment as they obtain creditor protections in the event that your start-up fails. Additionally, the investor has a known quantity they will acquire should the loan be paid in accordance with the terms of the agreement. However, this “known quantity” limits the amount an investor can benefit on their investment (i.e. if your start up becomes a multi-billion dollar company, they are still only making 5% interest on the $100,000.00 they loaned you). For the start-up or growing business, this is generally a relatively good opportunity. However, there are certain pitfalls that you will clearly want to avoid. Primarily, you will want to avoid any requirements to secure the note (especially in regards to personal assets) if you are at all able. Additionally, you need to make sure the the terms of potential default provide you with plenty of opportunity to cure said default prior to the investor foreclosing or bringing a collections action against you. Lastly, be 100% clear on the repayment terms and interest provisions of the loan; does it balloon, when does it come due, is it variable or fixed, etc. However, assuming that your company will be able to repay the loan in accordance with the terms, the ultimate result is that you get to retain the equity in your company, and the investor still has a good opportunity to make a decent return on his investment. It is important to note that if the recent housing foreclosure crisis has taught us anything, it is that it is very important that you understand the terms of a loan prior to entering in to an agreement; that is just as true for investment agreements as it is for mortgage loans. Owning stock in a company is essentially getting to own a piece of the company. This is a primary vehicle through which an investor can acquire equity ownership in your start-up or growing business. While it is conceivable that an investor might be willing to obtain common stock in exchange for his investment, the reality is that most investors (especially prior to an IPO) are generally interested in Preferred Stock. While Preferred Stock can mean a multitude of things, in general it provides your investor with first opportunity when dividends are distributed, when liquidation occurs, and will likely include some form of advanced voting rights within the company. Additionally, it generally provides the investor with the opportunity to convert the Preferred Stock to common stock in the event that it becomes lucrative to do so. Bottom line, Preferred Stock has more protections in place that make it more attractive to investors than common stock. From an investor standpoint, Preferred Stock provides the investor the opportunity to see a return on investment that increases along with the value of the start-up or growing business. Basically,The amount of money that the investor invests is in exchange for a percentage of ownership in the equity of your company; as the company value increases, so does the value of their ownership equity. As mentioned above, they will try and negotiation as many favorable benefits from the Preferred Stock as possible; while this is not unusual, the company should be careful to understand what powers the investor is trying to obtain through the Preferred Stock and to make sure that the investor does not overreach with them. In contrast with the Promissory Note discussed above, the primary detriment to an investor with Preferred Stock is that they do not have as strong a guarantee that they will see a return on investment; basically, the investor will see more profits if the start-up succeeds, but they will see much smaller or no profits if the start-up fails. This is more of a high-risk/high-reward investment for investors. On the side of being a start-up or growing business, providing your investor with Preferred Stock is a calculated decision. The benefits and the drawbacks should be relatively obvious in regards to what the investor will obtain with Preferred Stock. The question you have to ask yourself is do you want to give up a piece of your company in exchange for their investment. It should be mentioned that investors that tend to own Preferred Stock seem to maintain a stronger interest in your business than those that simply hold debt; this can be seen as a benefit (they truly believe in your idea) or a detriment (you receive a phone call every week asking how “our” company is doing). If this comes in the form of a helpful investor that is knowledgeable and often provides sage advise, then you should welcome your new equity partner. If it is not that type of person, be sure to carefully consider who you are getting in to business with. In the end, offering Preferred Stock in exchange for an investment is a very powerful tool that can attract many investors to your company. Be sure that you understand what powers are associated with the Preferred Stock being offered and that you are comfortable with whomever will be obtaining an equity share of your business. A warrant is very similar to what is known as an option, but in our experience a warrant is associated more closely with the investment stage of a start-up or growing business (where as an option is associated with employee benefits and other investment opportunities). However, the basic concept is the same; a warrant provides the investor with the ability to obtain stock in your company at a set price for a limited amount of time. Warrants will normally set the price for the stock above what the current value of stock is, but the investor will purchase on the hope that the stock value will increase past the warrant’s set price on or before the end date for the warrant. For example, you provide a warrant to an investor for a stock currently worth $2.00 per share, but stating that they may purchase said stock from your company at $3.00 per share up until December 31, 2020. If the stock reaches $6.00 per share on December 1, 2020, the investor will likely want to purchase those shares at the warrant price of $3.00 per share as they will be doubling their money for each share of stock they purchase. In terms of how a warrant can be utilized by investors and businesses, warrants can generally either be purchased on their own by the investor from the business (thereby allowing the business to acquire a little capital up front, and potentially more down the road when the investor exercises the warrant), or they can be added to an investment agreement as a “sweetener” to help entice an investor in to investing. For more information on warrants, an excellent article detailing warrants was published on Investopedia and can be found here. A convertible note is a mixture of both a promissory note and a sale of stock to investors. The investor would provide funding to the start-up or growing business in exchange for a promissory note as described above; however, the main difference would be that at a later date (or perhaps when a determined event occurs), the investor would have the option to convert the outstanding debt in to equity (i.e. stocks) at a price that was predetermined at the time of the investment. This is a preferred method by many investors as it allows them the best of both worlds. Obviously it initially provides an investor with the protections associated with being a creditor, allows them they ability to collect interest on their investment while the investment is still considered debt, and provides them the investor with the option to become equity owners at a later date should the business show acceptable growth and value. On the side of being a start-up or growing business, it generally allows you to acquire the investment at a lower interest rate than what would be associated with a normal promissory note, reduces the potential equity ownership of the investor the more the debt is paid prior to conversion, and allows the opportunity to wipe out company debt at a later time when (and if) the investor decides to convert their interest from debt to equity. A newer form of investment agreement has taken hold recently that is somewhat a mixture of a sale of stock, warrants and convertible notes, but avoids a lot of the risks involved with each for both investors and start-ups. Additionally, these new SAFEs (Simple Agreement for Future Equity) are designed in such a way to be simpler to understand and should not require nearly as much time, effort and money for legal negotiations. In its most simplistic conception, a SAFE allows an investor to immediately invest in a company, and for that investment to later convert in to equity when the company has some form of a liquidity event (i.e. equity offering to other investors, sale of the company, etc.). However, this is not a debt instrument like a convertible note and neither party will have to deal with the difficulties or worries of accruing interest or maturity dates. Instead, the investment is simply a current payment for future equity in the company that reserves a potential lower equity payment for the SAFE investor when the company is later valued for a liquidity event. In order to entice the investor to invest, a valuation cap is applied at the time of his investment. This means that when it is later determined what the valuation of the company is for a liquidity event, the investors shares are still determined by the value of the valuation cap; even if the actual valuation is higher than what the valuation cap reserved by the investor was. This is similar to a warrant, but without the time limitation (and other restrictions) most warrants have imposed upon them by government regulators. For example, if an investor invested $100,000.00 in a company through a SAFE with a valuation cap of $10,000,000.00 and the company later decides to have a round of offerings to other investors and the company is valued at $20,000,000.00, the valuation cap for the SAFE investor for purposes of determining the price he/she would pay per share would still be considered $10,000,000.00. So, if it was determined that the company would have 2,000,000.00 shares of stock, the standard price for each stock for regular investors would be $10.00 per share. However, for the SAFE investor, due to the valuation cap of $10,000,000.00, his cost per share would only be $5.00 per share. Although the above focuses on the most general version of a SAFE, it should be noted that multiple examples of a SAFE have been developed and implemented. For additional details on SAFEs, an excellent article detailing them was published by The National Law Review and can be found here. It is imperative that you understand any investor agreement that you are entering in to. Whether you are the investor or the start-up/growing business, make sure you take the time to have your investor agreement reviewed by a knowledgeable attorney. Nowakowski Legal PLLC is fully available to review any investment agreements either you and/or your business is presented. 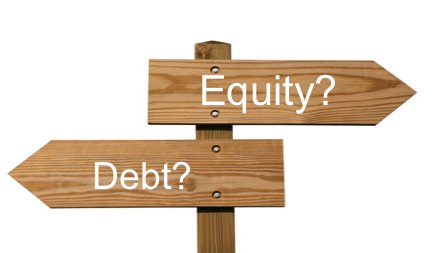 Startups are in a different position from existing businesses in determining whether to offer debt or equity. Hey very cool website!! Guy .. Excellent .. Amazing .. I will bookmark your web site and take the feeds also?KI am glad to search out a lot of helpful info right here in the submit, we need develop extra strategies in this regard, thank you for sharing. . . . . .
Equity tends to indicate positive financial health for the individual in that it shows an individual’s capacity to pay off their debts in a timely manner and move towards actually owning the assets that they have borrowed. I just want to tell you that I am new to blogging and certainly savored this website. Likely I’m going to bookmark your blog . You definitely come with great articles. Thanks a bunch for revealing your website.